I saw the Custaxie in the latest copy of New Zealand Classic Car and thought what an incredible car. The history is fantastic because this car changed motor racing in New Zealand. Designed by Robbie's mate Tony Kriletich it was built 'under' a house in Grey Lynn by Tony, Robbie and a lot of mates. Having a budget of zero meant the guys had to be very innovative and they came up with an almost unbeatable car. Especially with Robbie at the wheel. The Custaxie came about after Robbie's dad refused to let him use the family 62 Ford Fairlane. He found a '55 Ford Customline and matched it with a borrowed 427ci Ford Galaxie competition motor from a speedboat. A lot of the innovation was in the body, because the Customline had to go on a crash diet, and the suspension. Aluminium panels were used but the coolest thing was the front end. In the mid '60's fibreglass front ends were not the norm and so they had to find someone to make it. First they built a mould from chicken wire and plaster of paris and then found someone to make the front end. Something we could do easily these days was a nightmare for them. The suspension is amazing with dual Koni's out the back and new axles and suspension links so they could get the widest rubber they could under the car. Amazing stuff and cutting edge technology. Then again with huge horsepower, around 500, getting the power to the ground is a priority if you want to go fast. This car is incredible and after years of being hacked around and forgotten has been rebuilt to it's former glory. If you get a chance to see it in action make sure you do and buy the latest New Zealand Classic Car for a great indepth article on a beautiful part of NZ racing history. i would like to know who told you all this-bs-about the old custaxie. 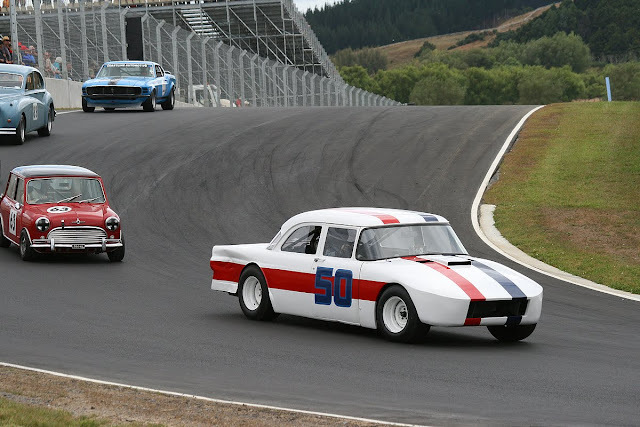 New Zealand Classic Car - read the article. I did as much research as I could. Not much about it apart from the article and some others along the same lines. Be great to have the real story if you have know it because it's a cool car. Who the hell are you Anonymous? I used to work for Robbie Francevic and from what I recall about conversations most of this is correct. There was also someone else who helped build the car, a panelbeater by the name of Eddie Forbes who had a shop in Kingsland up until a few years ago. It would be interesting to hear your story. Peter S.